Infrared Tube Heaters have capacities ranging from 40,000 Btu/Hr to 200,000 Btu/Hr and minimum mounting heights of 10 to 18 feet. 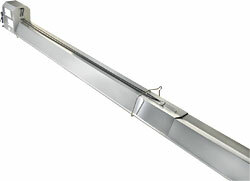 The PTS/PTU Series tube heaters use natural or propane gas. The Tube Integrity safety system, a low voltage circuit, continuously monitors the clearance between the reflectors and the ceiling for excessive heat and tube integrity compromise.